Friday, January 26, 2018 Region 11 Family, Career, and Community Leaders of America (FCCLA) held STAR Events (Students Taking Action with Recognition) and elections. Lockwood had eight student competitors earning four gold, one silver, and four bronze medals. The top two gold scores in each category advance to compete at Missouri FCCLA State Leadership Conference. Rachel Schnelle competed in Life Event Planning where she planned for moving into her future college dorm, and received gold advancing to compete at state. Amelia Stone competed in Leadership where she developed and acted on a plan to grow as a leader, and received gold advancing to state. 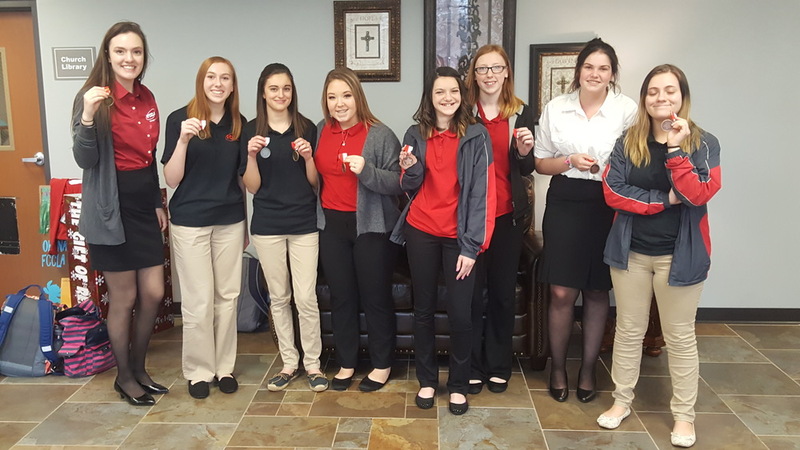 Breez Smith competed in FCCLA Knowledge Test where she received silver,and in Chapter in Review Display where she presented on the chapters program of work receiving gold and advancing to state. Raven Winefeldt competed in Chapter Service Project Display over the Gift of Reading community service project she led collecting books for the Moss House, and received gold advancing to state. Emily Janes, Olivia Hutto, Natalie Decker, and Jessica Dubs competed in FCCLA Knowledge Test each receiving bronze.